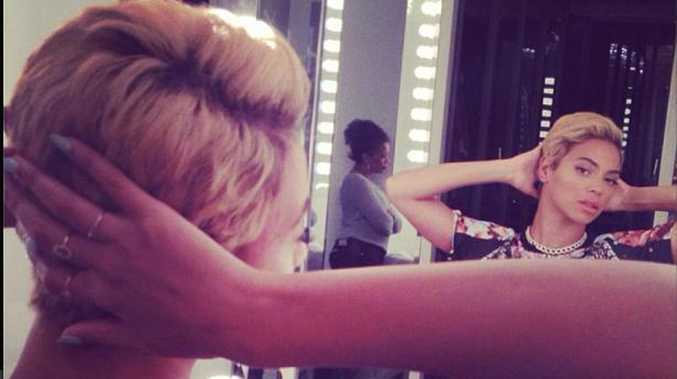 BEYONCE Knowles cut her hair into a short bob because she was feeling empowered. The 31-year-old singer - who is on a break between legs of her The Mrs. Carter Show World Tour - posted a snap on Instagram on Thursday morning (08.08.13) showing off her new look and her hair colourist Rita Hazan, says Beyonce ditched her long extensions and chopped off her hair because she is a "strong woman". She told Us Weekly: "I was shocked. I think she was just feeling empowered, like a strong woman, and she said she's been feeling it for a long time. "She didn't want to hide behind her hair in real life. "I'm so happy because the extensions give women the wrong expectation of what their hair should look like -- it's great for onstage, but everyday women shouldn't have or want to have five pounds of hair on their head. "This hair is more natural, more realistic." Rita dyed Beyonce's natural dark hair blonde and compared the 'Halo' hitmaker to Marilyn Monroe. She said: "[Dyeing] it took some time to do - like four hours - because we wanted to keep her natural shade at the root so it would grow out well. "We made it a champagne blonde - it's very old Hollywood, like a Marilyn Monroe blonde."